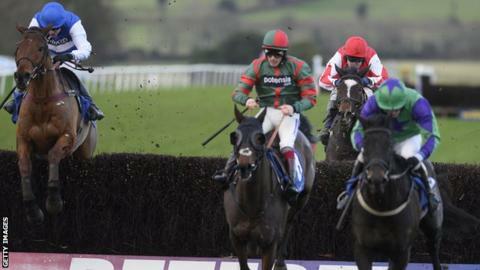 Emperor's Choice denied Benvolio and Glenquest in a thrilling finish to win the Welsh Grand National at Chepstow. But the Irish challenger ran out of steam after a big leap at the last, and Aidan Coleman guided Emperor's Choice home by a short head in front of Benvolio, ridden by Sam Twiston-Davies. "I've ridden some big winners in my career but this tops it," Coleman said. The Venetia Williams-trained horse, a 9-1 chance, took victory as Glenquest finished third, two-and-a-half lengths back. Previous winner Monbeg Dude briefly threatened in the straight and claimed fourth place. Coleman added: "I've never had a feeling like that when the photo was called. It's such a prestigious race and to win it for Venetia and the team is great. These are great owners of ours. "Venetia is a world-class trainer and she deserves better horses."